One of Tlön’s schools manages to refute time, reasoning that the present is indeterminate, that the future has no reality except as present hope, and that the past has no reality except as present memory. Another school claims that all time has already passed and that our lives are barely the memory or dim reflection, doubtless falsified and distorted, of an irrecoverable process. Another, that the history of the world—and in it our lives and every least detail of our lives—is the scripture produced by a lesser god to communicate with a demon. Another, that the world is comparable to those codes in which some symbols have no meaning and the only truth is what takes place every 300 nights. The whole universe of concrete objects, as we know them, swims … in a wider and higher universe of abstract ideas, that lend it its significance … time, space, and the ether soak through all things … form the background for all our facts, the fountain-head of all the possibilities we conceive of … We can never look directly at them, for they are bodiless and featureless and footless, but we grasp all other things by their means. 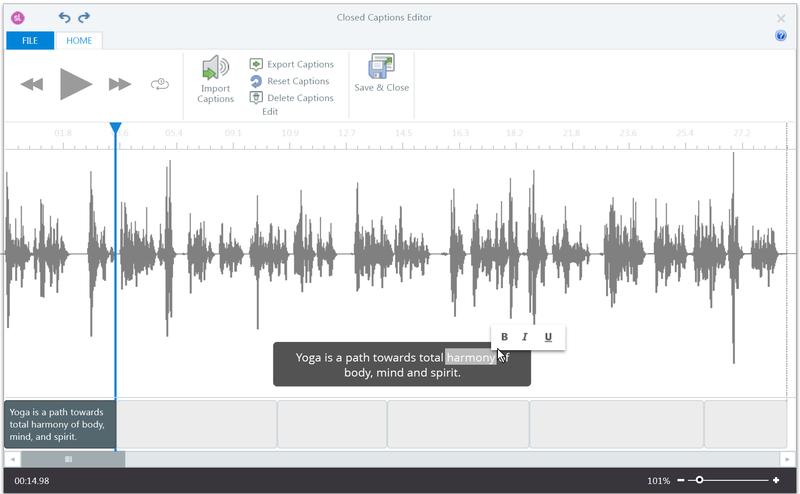 For the past few months, I’ve been working on a new feature for Storyline 360: a closed captions editor that allows users to create and edit captions for their audio and video media. This project allowed me to work on and think deeply about some of the multi-threading challenges that are characteristic of software that exposes a timeline, supports a playback mode, and allows users to navigate forward and backward through time on this timeline. Disclaimer: I am not a C# multi-threading expert. 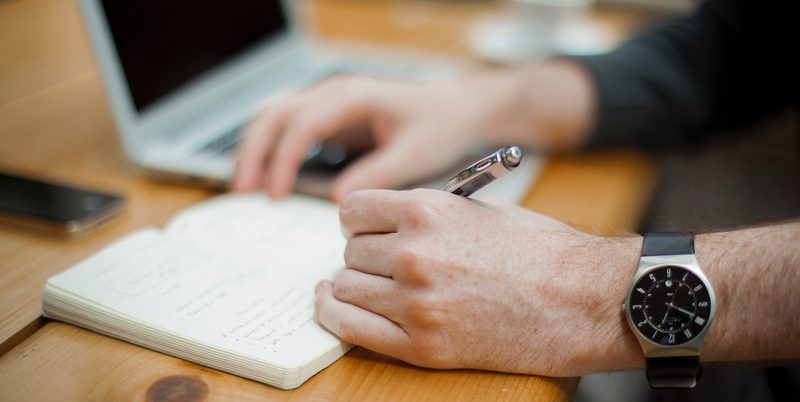 The “correctness” I target in the real world and this blog post is the “correctness” that passes the black-box testing I describe in the “Verification” section of this post. In its most simple C# iteration, we can imagine our clock built on a System.Threading.Timer timer and a TimeSpan currentTime field that gets progressed forward in time on each tick of the timer. For our clock to be more useful, it might also expose: Play(), Pause(), Stop(), and Seek() methods and a NewTimeValue EventHandler. What’s the Matter with Seek? In this version of the code, Seek() no longer works reliably. We may be playing through the timeline in playback mode and, when we try to seek to time A from our current time B, we find ourselves at time B on the timeline. What’s going on here? Simply put, the clock’s timer and the UI seek functionality are racing to set the current time value on the clock component from separate threads. As NewTimeValue becomes more complex, it becomes more likely that we see an old timer value come into ClockOnNewTimeValue() after the clock’s value has been updated by the UI-driven Seek() operation. That bug is just one version of a whole category of race-condition bugs that can emerge in this kind of architecture. Here’s another example we encountered in the closed captions editor: If a user clicks on a caption that is partially outside the currently visible timeline area, we want to scroll that caption into view. That scroll operation is racing against a clock-driven timeline scroll, which occasionally results in all sorts of scrolling and visual nonsense. To protect against these potential issues, we’ll want to enforce the following requirement: After the user seeks on the timeline, the NewTimeValue callback shouldn’t process any time values initiated by the clock from before said seek operation. Locking over updates to the Clock.currentTime field and the NewTimeValue event is an intuitive solution that will occur to every C# developer. Locking in this way will guarantee the atomicity of all time updates so that NewTimeValue can never see a stale time value after having already processed a more recent Seek() value. The answer: ClockOnNewTimeValue() takes longer to compute than the period of our underlying threading timer. Additionally, our clock.Tick() invocations are happening from multiple threads in the thread pool, and each thread has to wait its turn to acquire the @lock lock in Tick(). That results in the accumulation of “back pressure” as threads are queued up to acquire the lock. This back pressure can prevent the UI-driven clock.Seek() method from ever getting to the front of that queue, preventing the Seek() operation from progressing. It goes without saying that this is a nightmare bug. It blocks the dispatcher and freezes the UI. We can’t expect to know how long any particular ClockOnNewTimeValue method execution will take. It may depend on any number of unique application-state conditions, and system characteristics which, in addition to the code, is liable to change at any point in the future. Part of a solution is to require all background Tick() operations to happen on the same background thread. That is accomplished by moving away from the Threading.Timer and replacing it without our own managed thread that pumps out time values in a loop. That is, it works until we try to do any UI-related work inside our ClockOnNewTimeValue() method. Now we’re exposed to a nasty deadlock. Our breaking scenario: The user clicks on the UI to perform the Seek() operation from the dispatcher thread, and is blocked on the clock’s @lock lock. At the same time, a Tick() invocation has acquired @lock, which is blocked on the dispatcher thread trying to perform a Dispatcher.Invoke() operation inside ClockOnNewTimeValue(). One possible solution for our deadlock problem is to replace any Dispatcher.Invoke() that can happen within a @lock lock with a Dispatcher.BeginInvoke(). Unfortunately, this kind of solution is delicate and tough to enforce. In a more complex version of this app, it can be expensive to move away from synchronous Dispatcher.Invoke()s that are used within property getters, for example. In our closed captions editor, the code for extracting HTML from rich text boxes on our timeline is dispatcher bound, so it would be an expensive and fraught refactor to eliminate the Dispatcher.Invoke() in that case. Another possible solution that comes to mind is to marshal all user-initiated events to the thread pool by nesting calls in a Task.Run(). That is hardly appealing. Pushing UI events to a background thread for no apparent reason is a maintainability nightmare and a code smell. It results in all sorts of obstacles around exception handling. Although appealing at first glance, another reason to be skeptical of the aforementioned locking solution is that it requires locking over a raised event, which is always risky and looks suspicious. At a basic level, “thread safe” means that our application won’t crash because of a cross-thread access exception—and it won’t deadlock. But for us, thread safe means something significantly different in the context of our timeline application: enforcing an order in the NewTimeValue events that we process. It also means guaranteeing a coherence and consistency in our time-processing logic. The contours of this consistency are unique to the application we happen to be working on and the specific requirements we’re trying to meet. Deadlock bugs are terrible. A deadlock generally means: a) all unsaved application state is lost; b) the application won’t crash so no diagnostics or errors get reported; c) the user is stuck with a frozen application that they must kill from the task manager; or d) we are dealing with a rare, non-deterministic, hard to reproduce and hard to diagnose bug that haunts the dreams of developers, testers, and managers. For this project, we’re concerned about processing spurious and inconsistent time values that can periodically break seeking or scrolling on the timeline. Rare seek and scrolling glitches are far more tolerable than equally rare crashes or deadlocks. In practice, we may be willing to exchange an occasionally glitchy seek for increased confidence that our application won’t ever deadlock. Broadly speaking, there are two major sources of date and time data: clocks, and the brains of users. … There are some areas of overlap, of course: a user can enter their date of birth, which is a coarse representation of a specific clock time. Or you may have someone manually logging events somewhere, with that log later being reconciled with system-generated events. These can sometimes lead to grey areas with no one “right” decision, but I would still tend to consider these as user data. So far, our investigation has left us with two questions: 1) how do we accomplish a timeline seek in a way that is coherent, consistent, and safe and 2) why is this problem so surprisingly hard to solve? The answer to the second question is this: It’s because we’re using a single method and a single data type for handling time values that come from user input (a seek operation) and those that come from an underlying clock tick. On the one hand, when a user seeks to a point on the timeline, we expect the UI to reflect the same state that would result from traversing that same point on the timeline during timeline playback. However, from a philosophical perspective, these two sources of time values are completely distinct and operate in profoundly different ways. For example, we expect clock time values being pumped in the context of a playback operation to be roughly continuous. User-generated time values, on the other hand, are always expected to be discontinuous (for most applications, we don’t expect and don’t care to support a user trying to navigate through the timeline in 10-millisecond step sizes). Clock-generated time values are produced at a high frequency, and are subject to subtle back-pressure bugs and spurious and invalid value bugs—not so for user-generated time values. 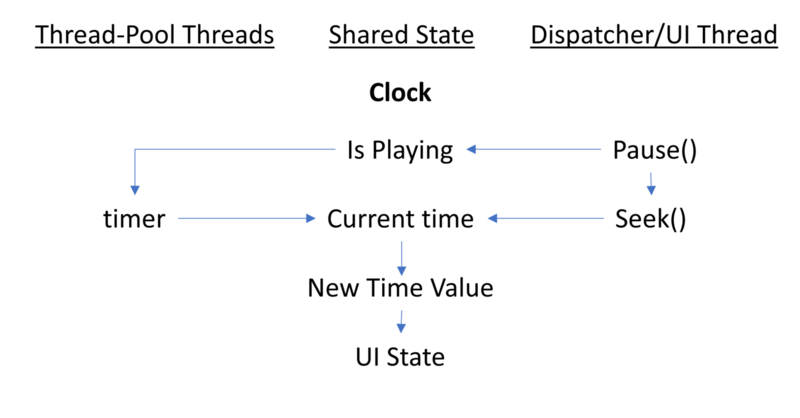 In other words, to achieve thread safety in our context, we need to enforce a sense of thread safety that’s rooted in the specific dynamics of user time and clock time as defined by the uses and requirements of our application. In the context of our time-driven application, thread safety means that user-generated time values are always respected and given precedence over clock-generated values. It also means that we should never drop a user-initiated time value. However, we are cautiously skeptical of clock-generated values, and don’t have a problem dropping some of them if we think there’s a chance they might be stale or spurious. Armed with these assumptions, we can achieve our desired sense of thread safety by explicitly noting the source of the time value we’re seeing and handling it accordingly. We can modify the NewTimeValue callback to include a parameter that indicates where this time value came from. If the time value came from a user-initiated seek or pause, we set a flag that tells us to suppress all clock-initiated time values until we get a new clock value initiated by a user “play” operation. We can write a filter that sits on top of the NewTimeValue event and is solely responsible for maintaining the current time value. This ClockSeekFilter knows to always honor time values coming from a foreground thread, but has the liberty to ignore time values that come from a background thread if that time value is sufficiently surprising (discontinuous from the last assumed current time value). Notice that we aren’t returning currentTimeValue outside of Filter and passing that value to ProcessNewTimeValue. For ClockSeekFilter to be effective, we can only allow for one source of ground truth. That source must be the CurrentTimeValue property in ClockSeekFilter, whose value is only set under a class-local lock. If we were to return a CurrentTimeValue value outside of our filter, we would be leaking independent and potentially stale notions of the current time into our application logic. Specifically, if Filter() returned a time value from the clock running on a background thread, and then immediately returned a different and updated time value from a UI interaction, we can make no guarantees about the order in which these two values would get processed in ProcessNewTimeVaule()—thereby reintroducing the original race condition we were trying to fix. How can I be confident that the solutions I suggest here are effective? Is it because I’m a multi-threading expert? No. It’s because I wrote a test harness that exercises PlayPause() and Seek() in a tight loop. This test class is simultaneously checking to see that we can still acquire the dispatcher so we know we haven’t deadlocked. For each proposed solution, I let this test harness run for some time to gain confidence that the application doesn’t crash or deadlock. When dealing with complex multi-threading applications, this kind of black-box testing is generally the only reliable way to gain confidence in the correctness of one’s code. Philosophers and scientists have long debated how to understand time. At the heart of this debate is a dichotomy between a conception of time as an absolute frame of reference that encompasses and animates all of nature on the one hand, and a conception of time that allows for an abundance of contradictory times and timelines and independent notions of temporality. Einstein’s Theory of Relativity revolutionized classical notions about the immutability of time by describing it as a dimension that could be warped and distorted and could pass at different speeds for different observers. In his A New Refutation of Time, Borges makes the more extreme argument that time is the construction of subjective consciousness and has no reality outside of subjective human and psychological experience. When architecting clock-driven software, you end up negotiating the dichotomy between time as an absolute framework of perfectly sorted successions, and time as a localized and individuated notion that allows for contradiction, subjectivity, and indeterminacy. Our destiny … is not frightful by being unreal; it is frightful because it is irreversible and iron-clad. Time is the substance I am made of. Time is a river which sweeps me along, but I am the river; it is a tiger which destroys me, but I am the tiger; it is a fire which consumes me, but I am the fire. The world, unfortunately, is real; I, unfortunately, am Borges.